We know you probably just sent Christmas cards not too long ago, so we understand if you haven’t even thought about getting your address list out again, but have you seen our collection of Valentine’s Day photo cards? They’re almost too hard to resist. 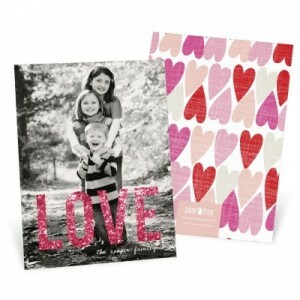 Besides, one of my favorite Valentine’s Day card ideas has everything to do with narrowing down the address list. You probably aren’t going to send valentines to your entire holiday card list (though, we wouldn’t stop you of course!) but why not just send valentines to your closest friends and family? My big Valentine’s Day card idea? Last year I ordered 24 and sent them to all the ‘ladies’ in my son’s life. Fellow infant girlfriends, grandma’s, great grandma, you get the point. He was 9 months old, shirtless in jeans and holding a rose. Cute, right? How quickly you forget all of those rolls! This year I think my list has expanded a little, but I think I’ll still only send around 32-40. (YES! You can order in quantities of only 8!) It’s a fun occasion, and I know my family loves getting them. 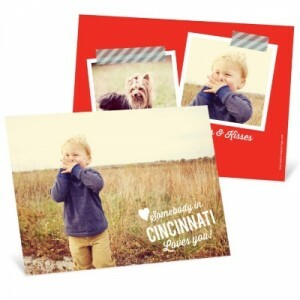 Take a look at our adorable collection of Valentine’s Day photo cards, and if you still think sending them isn’t for you, think of the smiles you’ll bring to those that open your card! For more Valentine’s Day card ideas, keep reading our blog.